There are three main data points by which New York City mayors are usually judged on their management of city schools: state standardized test scores; and rates of student graduation and college-readiness. As Mayor Bill de Blasio is now in his second year at the helm of the city’s 1,800 schools and 1.1 million students, his ability to improve these numbers is coming under intense scrutiny - from parents, pundits, and Albany lawmakers, among others. In a recent speech called “Equity and Excellence,” de Blasio outlined a series of new education plans aimed at improving the opportunities and outcomes for city students. Many applauded the mayor’s announcements, which included more algebra, computer science, and reading coaches. Others, however, say benchmarks for student success are being set too far off and that more robust and immediate change is needed. Some continue to push de Blasio to close underperforming schools and embrace an expansion of charter schools. “Our vision for the New York City public schools is that every school is going to be brought up to the point of excellence. We are putting an unprecedented level of resources in – that’s how we achieved full day pre-K for every child in this city - and that’s going to have a huge impact on the future of our children and our schools,” de Blasio said last week on 1010 Wins radio. Over the course of two years, de Blasio and Fariña have put together an extensive education agenda. 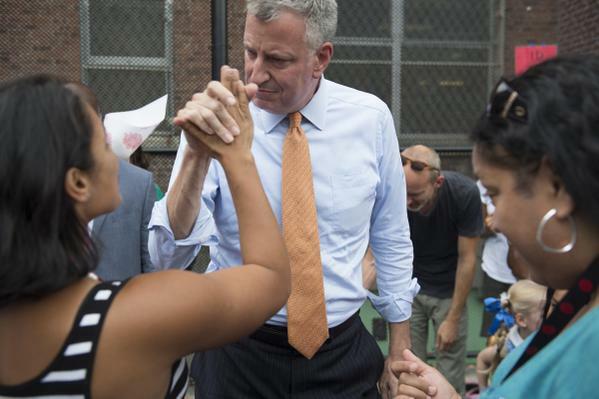 Progress, or lack thereof, will be a key to de Blasio’s 2017 re-election bid. More importantly, the success of the de Blasio/Fariña era of city school control will be key to the future of many young people. Parents and guardians of the city's 1.1 million students are seeing firsthand every day whether their children's schools give them confidence in those in charge. As stakeholders and watchers keep tabs on the mayor’s education agenda and its impact, Gotham Gazette takes a detailed look at de Blasio’s major programs and how they fit into the assessment of this mayor’s education leadership. GRADUATION RATE: The most recently published graduate rate, from 2014, shows 64.2 percent of high schoolers graduated in four years (including August graduates, the percentage rises to 68.4). Indicative of a long-term upward trend, this also shows an increase, with the August rate up 2.4 percent from the year before. COLLEGE-READINESS: In 2014, 32 percent of students tested high enough to be considered “college ready.” The college-ready metric, initially introduced by the state, is determined by percentages of students who attain a score of 75 or higher on the English Regents and 80 or higher on the Math Regents (Regents exams are state standardized tests for high school students). This signifies that students will not require remedial classes to attend four-year CUNY universities. To ring in the new year and quiet some of his critics, Mayor de Blasio gave a wide-ranging September speech to unveil several new education initiatives. Announcements of new efforts to ensure all students are reading at grade level; offer more algebra, advanced placement, and computer science courses; and individually guide the system’s most vulnerable students were mostly met with praise from officials, advocates, parents, and others. Though all agree with the mayor’s expressed principles of “equity and excellence” in all New York City public schools, there are skeptics who question if the mayor is going far enough or fast enough, and those who question how well his programs, new and otherwise, will be implemented. After all, if one-third of grade 3-8 students are proficient in math or ELA, that means that two-thirds are not. The numbers become even more frightening when looking at the city’s lowest performing schools, often in its poorest neighborhoods and populated by children of color, where there are in some instances grades full of students who do not meet the state standards. De Blasio and others do question the new state tests and caution against using standardized test scores as the end-all. They also point to high poverty rates and the challenges faced by students that impede their ability to learn. Still, the mayor consistently acknowledges there is a great deal of work to be done to make all schools good schools. He has little choice but to confront that reality. A new report from pro-charter school organization Families for Excellent Schools shows that black and Hispanic students beginning high school in New York City are one-fourth as likely as their white and Asian counterparts to earn a bachelor’s degree. Much of the mayor’s wide-ranging education agenda - beginning with pre-K - is aimed at increasing opportunity and fostering greater equity. Many ask how de Blasio and his schools chancellor, Carmen Fariña, plan to measure progress on their signature changes to the city’s education system, looking for both what metrics and what benchmarks are in place to assess and ensure success. They and other top city officials are often hard-pressed to give data points other than the big three mentioned earlier, though they cite things like attendance rates and Advanced Placement course access and enrollment. In de Blasio’s most recent announcement, he outlined several goals set a number of years down the road - such as increasing the proportion of high school graduates deemed ‘college-ready’ from less than half to two-thirds by 2026 - leading many to wonder about more immediate effects and goals. Some note that even a goal set that far into the future leaves one-third of city graduates not deemed ready for college. Some schools and students must see immediate progress. Each of the city’s 94 “renewal schools,” the city’s persistently low-performing schools up against the prospect of state takeover, will have set benchmarks to meet, which usually include attendance and test score improvements. 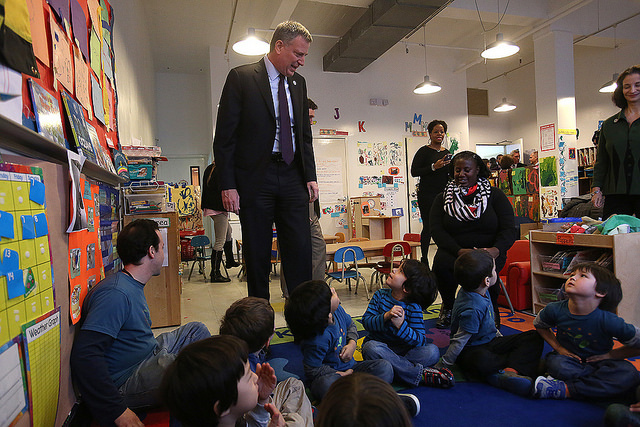 De Blasio is banking on his pre-K initiative to be a game-changer. And it may be, but time and again de Blasio and others are asked how the program is being evaluated and there are few concrete answers, though a consultancy has been hired to track it. Much of the program’s efficacy will be pegged on the third-grade test scores of the students who have enrolled in the program (third grade is the first year of state standardized tests and seen as a key year for assessing whether students are reading at grade-level). On the first day of school this year, in September, Mayor de Blasio celebrated the progress of programs implemented thus far in his tenure, including the expansion of UPK to enrolling more than 65,500 four-year-olds across the city; 130 new community schools; 126 PROSE schools, which are schools working with unique models and outside of some typical union rules; and free after-school programs for all middle-schoolers. Most of the celebration, though, involves their launch, and with much of it still new, like de Blasio as mayor, there is little else to measure yet. The following week, de Blasio announced the roll-out of another wave of education programs buttressed by a vision of public schools running on the “twin engines of equity and excellence.” Programs outlined included computer science and Advanced Placement courses for all; universal second grade literacy; “Single Shepherd,” by which at-risk students are provided individualized counselors; and college campus visits for all before ninth grade. “Excellence and achievement cannot, and should not, discriminate...As we increase the number of student success stories, we have to make sure success is as common in East New York as it is on the Upper East Side,” said the mayor, striking the central theme of his campaign and his mayoralty. Along with Dromm, Gotham Gazette consulted several education experts and advocates to discuss the mayor’s education agenda and related metrics. “In principle, [universal pre-k] is an extremely good idea, but in practice, it will depend on the caliber of the program,” David Steiner, executive director at Johns Hopkins Institute for Education Policy and former New York State education commissioner, told Gotham Gazette. Suggesting a teacher residency program model in order to equip teachers with the clinical skills they need to ensure preparedness and high-quality instruction in the classroom, Steiner is among those who want to see systemic focus on teacher preparation and quality. Along with teacher quality, Steiner cites sufficient socialization, play-time, and acquiring skills such as “phonemic awareness” for the students as critical to building the foundation for reading and long-term success in learning. The de Blasio administration has indeed highlighted the significance of teacher instruction, offering the city’s first-ever “Citywide Professional Development Training specifically for pre-K,” with 6,000 educators participating at the launch of the program in 2014. It is not the residency system Steiner recommends, which would be more robust and expensive. The mayor and others have continually stressed that pre-K is “high-quality,” but it is unclear exactly how prepared the teachers are and how strong the curriculum is - which is where internal and external evaluation will come into play. There will, of course, also soon be those third grade test scores for the first class of pre-K participants. One major question about pre-K is whether initial gains that participants show last through third grade. Instructional coaches from the DOE are placed in schools to provide professional development - which, generally speaking, has been a major focus of Chancellor Fariña, a former teacher and principal herself. “As we move forward with this expansion, we must renew our focus on supporting our pre-K teachers and assistant teachers and creating an atmosphere of engaging and fun learning and play that puts our youngest learners on the path to success in kindergarten and their continuing education,” said Fariña at the initial pre-K launch, in 2014. De Blasio spokesperson Wiley Norvell told Gotham Gazette that the first wave of pre-K metrics will be released this fall. Norvell described skill acquisition as essential, along with classroom interactions, and available activities. Pre-K participants are, after all, four-year-olds. When asked about ensuring quality in pre-K, the mayor has often stressed that the curriculum involves establishing key learning basics, such as those needed to become a successful reader, as well as plenty of play, which also builds skills. Norvell stressed that enrollment itself is key to the success of the program, especially among disadvantaged families. "This is a two-year expansion, and the first year was heavily focused on low-income communities that benefit most from high quality pre-K. In the ten lowest-income communities, enrollment more than doubled last year. And that focus continued this year, where we pushed and successfully enrolled more than 1,000 children whose families were in homeless shelters,” Norvell told Gotham Gazette. Moving children from under-resourced and unstable environments into school a year earlier can have significant effects in terms of their socialization and language acquisition. Community schools and renewal schools -- at the heart of the mayor’s education reforms -- provide striking examples of divergent policy from de Blasio’s predecessor, Mayor Michael Bloomberg. De Blasio has promised to close schools only as a “last resort,” focusing rather on providing more and better resources to schools which may be struggling. The city’s most-struggling schools are the renewal schools, almost all of which are part of the community schools program, which means these schools become hubs of services, such as providing health care for students or English classes for parents. In this regard, Bloomfield appears aligned with de Blasio, who has decided that instead of closing schools and reconstituting them as smaller schools with a remade faculty, that he would flood struggling schools with resources. Assessment of “student learning across multiple measures,” not simply discerned through testing, as well as “professional observation” to determine teacher quality would give a more accurate portrayal of student and teacher performance, Bloomfield says. “We are investing in tools that we know help students catch up and succeed – more learning time, extra tutoring, coaches to help teachers improve instruction,” said the mayor at a press conference with students and faculty of Richmond Hill High School, one of the 94 renewal schools. “We have a plan to fix long-struggling schools, and we’ll hold ourselves and these schools accountable for results,” de Blasio said. When discussing his stewardship of city schools and the mayoral control system that New York City mayors are allowed through state law, de Blasio has repeatedly said that he has the education system on the right track and that closing school doesn’t solve the problems facing the students in them. He says he will be judged by voters come 2017. Still, critics believe that the community and renewal school school approach of extra resources is not the answer, but that closing schools and opening more independently-run charter schools is a better general alternative path. De Blasio has been a vocal opponent of the expansion of charter schools, though his rhetoric on the subject has cooled of late. The mayor and others have talked of partnering with charter schools as an opportunity to increase the quality of education in public schools. A controversial recent advertisement by Families for Excellent Schools, the pro-charter group, slamming de Blasio for “forcing kids into failing schools” is indicative of a long-running dispute. 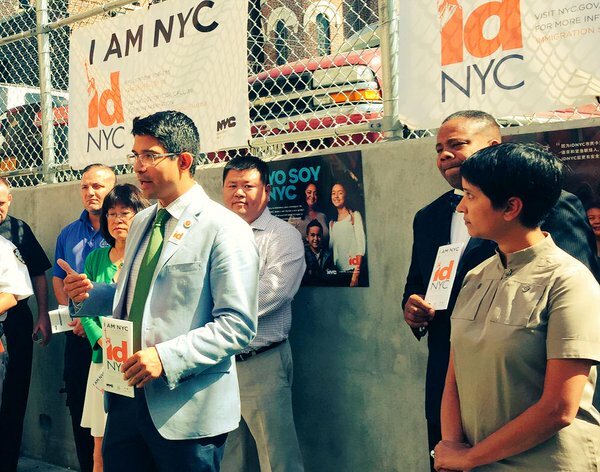 Prior to that ad, which is being followed by another critical of the mayor’s education leadership, and a large pro-charter, anti-de Blasio rally, the mayor announced a new program to fund 50 formal partnerships between district schools and charter schools. The administration cites that it will be similar to the Learning Partners Program, matching “host” schools with “partner” schools for collaboration on areas of demonstrated need by the partner schools. Drawing from individual strengths, schools will apply and be matched in pairs “to learn from each other's best practices” creating District-Charter Learning Partnerships. Moreover, another DOE effort to support struggling schools is the Progressive Redesign Opportunity for Schools of Excellence (PROSE) initiative. Led by the Office of School Design and Charter Partnerships (OSDCP), the initiative aims to design and develop new schools, overhaul under-enrolled schools, and support school flexibility. While de Blasio and Fariña’s teams track multiple measures, and have revamped the system by which schools are graded to show a diversity of metrics instead of a single letter grade, much of this can be seen as alphabet soup by those who simply want to know: are schools improving or not? There’s no getting around the fact that schools will largely be judged by state leaders and others through their standardized test scores, seen by many as the best objective measure. Every elementary school will receive support from a reading specialist to ensure students are reading at grade level by the end of second grade, Mayor de Blasio announced, noting that early intervention determines long-term success for young children and the importance of early literacy. Robert Pianta, dean of the Curry School of Education at the University of Virginia, suggested “process-based metrics” in which a student is evaluated over time to gauge improved reading skills for grade-level proficiency by the end of second grade. This would create stronger tracking and assessment well before those third grade tests scores come back. “Our goal is to have all second graders reading with fluency by 2026. Teachers will track students’ progress through nationally-recognized assessments, and provide the right kind of additional support to those kids who need it,” announced the Mayor. Clearly, the success of this initiative will mostly come down to student scores on the state ELA tests all students take in third grade. One especially important subgroup to watch will be English-Language Learners, or students whose first language is not English. While this is true throughout all grade levels, it is important at younger ages that students show they are beginning to master the official language of most of their schooling. “For New York City public high school students, algebra 1 represents either the gateway to advanced math or a huge, even insurmountable, stumbling block in their education,” begins an August 2015 report prepared by the Center for New York City Affairs at The New School. Why is that so? The report states that the vast majority of students can fulfill math requirements for graduation by passing the Regents exam for the algebra 1 course. And the test has only become significantly more difficult. A new exam was introduced in June 2014, aligning with the tougher academic standards of Common Core, as required in New York State. The test now consists of material that used to be on Algebra 2/Trigonometry Regents exams. The difficulty of the exam has elicited reactions ranging from concern to outrage given the high stakes for students who may not graduate on time - or even not at all - depending on exam results. Part of the issue at play with algebra, like in other instances, appears to be access. Today, less than 60 percent of public middle schools offer some algebra coursework. By 2025, every student in elementary, middle and high school will receive computer science education. Funded through a public-private partnership, city money will be matched by New York City Foundation for Computer Science Education (CSNYC), Robin Hood Foundation, and AOL Charitable Foundation for a total of $81 million invested over the next 10 years. Speaking with Gotham Gazette, Natasha Capers, parent leader and Coordinator of Coalition for Educational Justice, shared in the praise saying “giving [students] this education [will] build the workforce” of the future. An initial pilot program during the 2014-15 school year, the Software Engineering Pilot (SEP), has implemented computer science classes in 18 middle and high schools, enrolling 2,700 students for courses about web design, coding, robotics and more. Computer science classes will expand significantly in other schools beginning in Fall 2016. Some do not see computer science coursework as necessary for every student. De Blasio and others who support the initiative say that it will have multiple positive effects, including engaging students in school, preparing students for the workforce, and enhancing thinking schools. If it is part of improvement in college-readiness and workplace success rates, de Blasio will get credit. Today, nearly 40,000 students are enrolled in high schools, grades 9-12, that do not offer Advanced Placement (AP) courses. Low-income students and black and Latino students are particularly affected, with only 44 percent enrolling in AP. Full implementation of AP for All is projected for Fall 2021, by which AP courses and prep classes will be available in all schools. Again here, some may point to a far off goal. Progress will be measurable each year in terms of additional offerings, but it is a multi-year expansion plan, and one aimed at improving college-readiness, but also college graduation rates. This initiative builds on the AP Expansion program created in 2013 by the NYC Department of Education which has implemented AP courses in over 70 schools since its launch. Kim Nauer, education project director at Center for New York City Affairs, notes that statistically it is true that more students of all income levels are attending college but many are not completing their degrees. Taking AP courses in high school often serves as effective preparation for college course loads. In fact, “we know students who take AP classes are twice as likely to graduate college in five years, compared to those who don’t,” noted de Blasio. Students are also more likely to be prepared for college and careers with individual support from school guidance counselors. College campus visits, assistance in completing applications, mentorships with college students and strategies for family financial planning to afford college tuition are all resources which will be available for students, sixth-twelfth grade, launching in Fall 2016. In increasing the focus on college preparedness and college goal-setting, de Blasio may be taking a page from the charter school book. Supporters often note that many charter schools have a college-going culture in place, talking with students about college from kindergarten onward. The Single Shepherd program pairs counselors with specific students from sixth grade through their high school graduation and college enrollment, and is being piloted in District 7, in the South Bronx, and District 23, in Central Brooklyn. The program will launch in Fall 2016. “Districts 7 and 23 have among the lowest graduation and college readiness rates in the city, and each serve high poverty, high needs students. We selected two districts with high need, in different areas of the city, and of varying size to serve as proof-points for the initiative so that with evidence, it can be scaled to other communities,” said Department of Education spokesperson Devora Kaye, in a statement to Gotham Gazette. Students in the program, and the program itself, are sure to be measured in terms of improvements in attendance, grades, and test scores, along with graduation and college-readiness, as Kaye mentioned. Zakiyah Ansari, advocacy director at the Alliance for Quality Education, also said it is important to watch suspension rates. Ansari, whose group is largely aligned with the mayor and the teachers union, highlights the importance of looking at graduation rates and college placement for students, but also said more schools should be implementing “restorative justice practices,” referring to an approach to school discipline and community building that strays away from suspensions in most cases. The social and emotional well-being of students and parent and community engagement are “crucial” for student success, Ansari said. De Blasio and Fariña have devoted new resources to restorative justice and believe that keeping students in school when suspension is avoidable will give students a greater shot at success. Students for which restorative justice is an alternative to out-of-school suspension are likely to be candidates for the shepard program, though that program is only seeing a small pilot in the next school year. Still, the shepard program is another example of the de Blasio administration infusing significant resources toward addressing education problems. Professor Bloomfield brought up one key for any big city mayor, the differences in learning experiences and outcomes of students of different racial and ethnic backgrounds. There has been a renewed focus of late on New York City’s segregated schools - the city’s schools are among the most segregated in the country, some of which has to do with the city’s housing, which largely determines elementary school enrollment. There are enrollment and admissions policies that many want to see changed. Others, still, want to see the expansion of charter schools - less so to reduce segregation and more so to reduce the so-called achievement gap between black and Latino students on one hand and white and Asian students on the other. Many charter schools have proved to be more successful alternatives to nearby district schools when it comes to student test scores, and charter schools in New York City are almost exclusively attended by children of color. This past summer, de Blasio signed the School Diversity Accountability Act, which tracks demographic data relating to grade levels and programs within schools, but lacks a mandate for actionable steps to reduce segregation. Bloomfield refers to the admissions process for the city’s specialized high schools. De Blasio said as a candidate and repeated as mayor, though not lately, that he wants to see the admissions process for the city’s specialized high schools change away from a single test. On the issue of school integration, de Blasio has been cool to innovative admissions models, instead saying that his pre-K and affordable housing programs would foster more integrated schools. Lori Podvesker, a parent-advocate and manager of disability and education policy at INCLUDEnyc, also discussed the problem of segregation in New York City public schools. Podvesker cites the lack of initiatives for District 75 students, who primarily have significant disabilities. “It feels like students receiving [special education] services are getting lost in this conversation -- and the overall education conversation -- because everything is being applied to all kids and it’s really not true,” said Podvesker, who also sits on the city’s Panel for Educational Policy. As de Blasio seeks an extension for mayoral control next year from the state legislature and Governor Cuomo, he faces tremendous pressure to ensure that others see his vision for education as his supporters do. 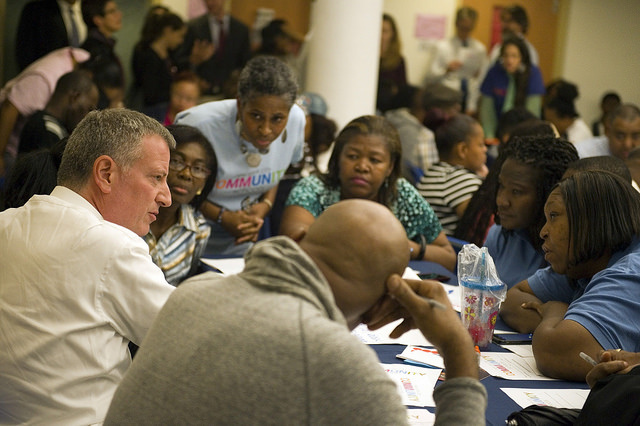 He must present immediate results beyond pre-K enrollment, and the mayor and his team know it. This summer, de Blasio took great pains to tout small increases in state test score results for students in grades 3-8, and will bring those gains to Albany, as well as his list of programs and any data he can to support their initial successes. In Albany in 2016 and then at home in New York City in 2017, de Blasio will be forced to present data - have test scores continued to rise? Are they rising fast enough? Have graduation and college-readiness rates improved? The mayor will also have to contend with the impressions of parents, each of whom has a personal experience with the school system. De Blasio will surely use whatever numbers he can to make the case that he has the city’s students on the right track. He’ll also make his equity argument, spelling out opportunity and access, if not yet excellence.